The Fountain of Ponte Sisto, also known as the Fountain of One Hundred Priests, is located at the Trastevere end of Ponte Sisto, in Piazza Trilussa. At the beginning of the 17th century the areas on the right bank of the Tiber (including the Vatican and Trastevere) had poor water supply. Pope Paul had just been elected and promised to bring water to that side of the Tiber, which he did between 1608 and 1610. Water pressure remained low on the left bank, including at the Hospice of One Hundred Priests on the Rome side of Ponte Sisto. 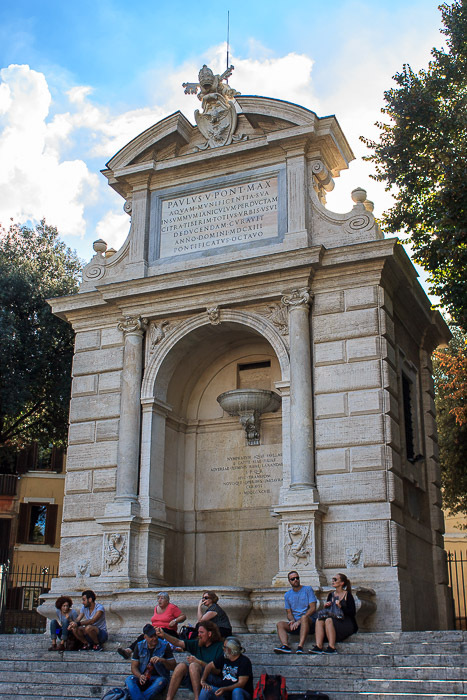 When Pope Paul then extended his new water supply across the river in a pipeline on the bridge, he had a fountain built on the side of the hospital with an inscription remembering this act by the pope. 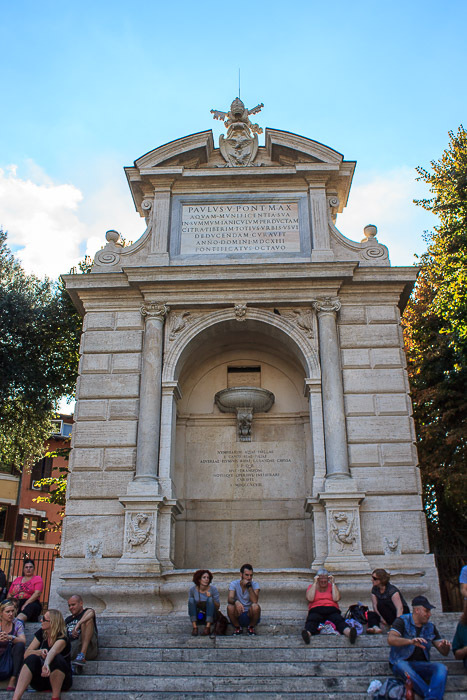 The fountain was built by John Vasanzio with the help of Giovanni Fontana, and was completed in 1613. It was a great niche bordered by two marble columns and large travertine blocks, on top of which was the inscription. In the upper part of the niche a big mouth poured a huge amount of water into a small basin which overflowed into a tank below which received more water from jets gushing across each other from the jaws of two winged dragons at its sides. Two lion heads poured in more water from the ends of the tank (photo below). It looks to me like quite an impressive fountain. See all Fountain of Ponte Sisto photos. 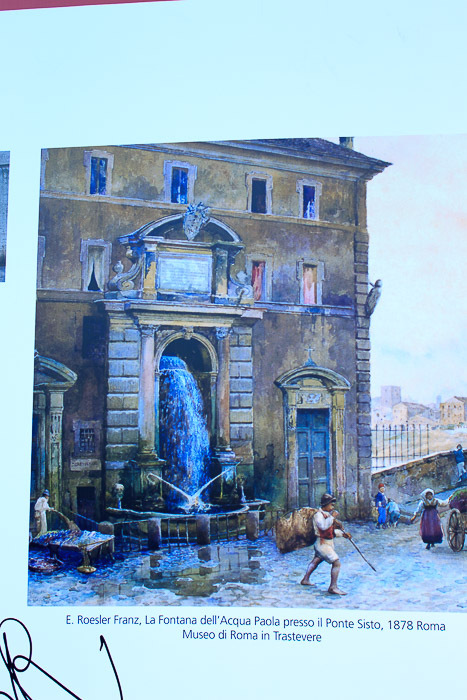 Around 1880 the hospice was demolished and the fountain was removed, but in 1898 it was restored and rebuilt on the opposite end of Ponte Sisto, in the square where it is currently located, placed on top of a flight of steps (two photos below). Only a little more than half of the original fountain could be recovered. From the far side of the river where the fountain once stood, you can see the fountain, with the Big Fountain on the Janiculum Hill above it (and further away, of course). In recent times the flow of water has been reduced substantially, to the point where the water from the dragons is a trickle rather than an impressive stream of jets crossing each other. These two photos were taken during the fall of 2014. During the fall of 2013, the fountain was covered by scaffolding while undergoing renovation (photo below). 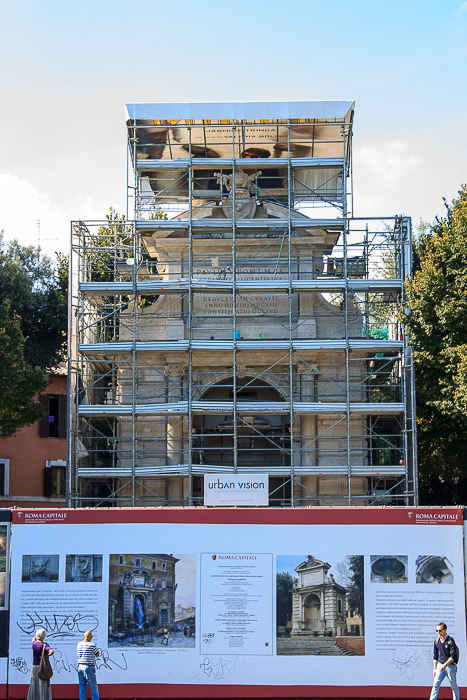 This makes at least 7 things that are undergoing renovation in fall of 2013, the other six being the Arch of Constantine, the Pyramid of Cestius, the Colosseum, the Triton Fountain, the Bernini Fountain and the Fountain at Villa Medici. The restoration was complete by the fall of 2014, as evidenced by the two photos above. 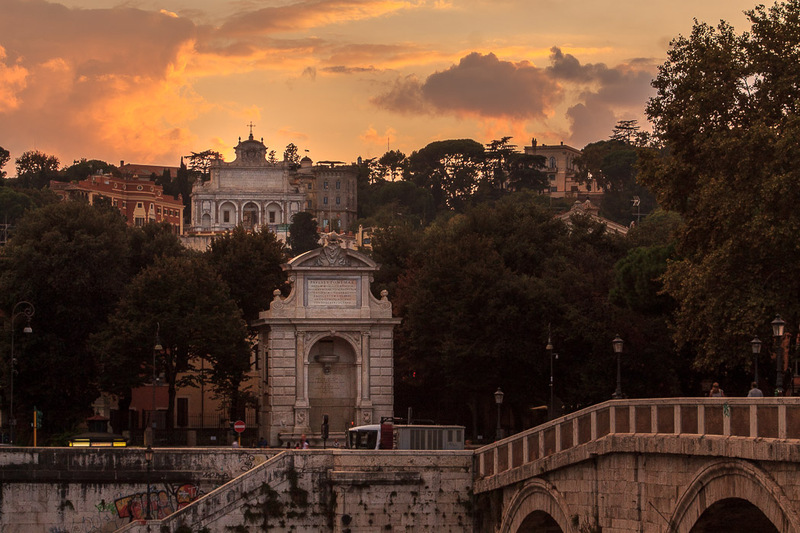 Sunsets from Ponte Sisto can be quite pretty, with the white Fountain of Ponte Sisto on the far end of the bridge, the Big Fountain on the Janiculum Hill behind it, and the colors of sunset behind them both, as in the two photos below. 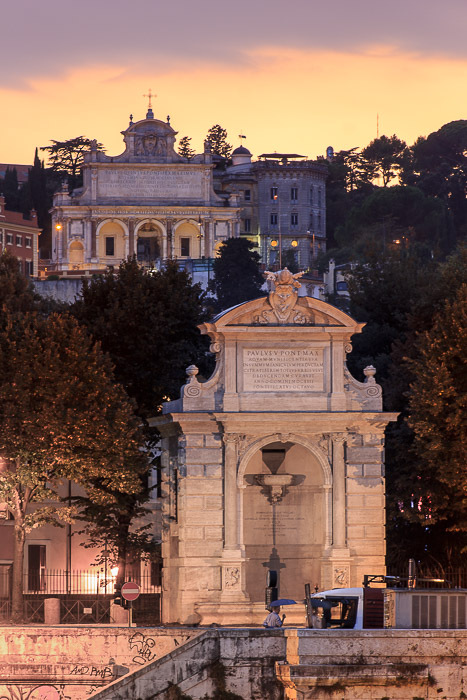 The Fountain in Piazza Santa Maria in Trastevere and the church of Santa Maria in Trastevere are both nearby.